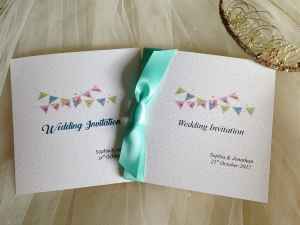 This is just a small selection of Aqua Green wedding invitations to give you some ideas – the majority of our wedding invitations on the main page are available with ribbon to match your colour scheme. This soft, pastel shade is a refreshing take on the usual green colour schemes. 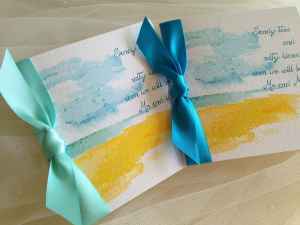 It’s the perfect shade for spring or summer nuptials, but you don’t have to be limited to a beach wedding to incorporate this seaside-inspired colour! Take a look at our Beach Wedding Invitations, they look fabulous with our aqua ribbon. We stock Aqua ribbon in satin and organza. 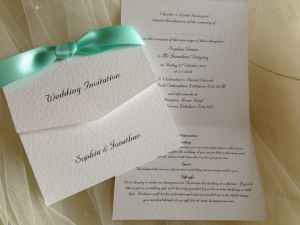 Order your Aqua wedding invitations today.